Vivienne leads the charge into the Morantine battery on page 3 of Engagement on Vineyard Hill. This page was a beast for Naty. So many figures; all in motion. I hope you enjoy it. To see a preview of the next page, please vote for Snow by Night on Top Web Comics. What is up with that axe? Why is it important? The answer is delightfully evil. bwah ha ha ha! Plug time! 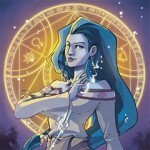 Ally is running a Kickstarter for her webcomic Chirault. She’s made her goal so now it’s time to hop on the bandwagon and score some of that sweet Kickstarter swag she’s offering. She’s a brilliant artist and it’s a good webcomic. I highly recommend backing it. also: that’s a crowd of people to draw! Doh. I forgot to update the link. Fixed! This Vignette has got me thinking. The locations and the back story are based on real world 17th / 18th century. Is the map of the World the same as ours? Probably not from my reading of the Almanac. Just trying to work out how the different countries fit together – not that it matters of course. But if you are looking for a new bit of art to sell, perhaps a geographical map of the World? The map of Corthis is almost the same as ours. Saronne is roughly the equivalent of Aquitaine and Gascony. Morante is the equivalent of Normandy and Brittany. The Alagnon River is based on the Loire. I’m looking at doing the map of the world as a stretch goal for the upcoming Volume 2 Kickstarter. That way I can hire a talented cartographer to do a beautiful map for us. To run from a cavalry charge is to die. Vale redcoats. You’re right, of course, but to stand against a cavalry charge without a firearm is to die even faster. The majority of those men are dead, no matter what they do. Considering that, running might save a few of them. If you were willing to die for the chance at a few more enemy casualties, you might stand and fight, hoping to buy time for the men down the line to turn their cannons, but you’d have to trust them to stand and fight, as well, and you’d definitely die in the process… but then, the ones closest are already in the “definitely dead” category. The cute redcoat gets shot or something!? Yuck!!! Call me crazy, but … What axe? 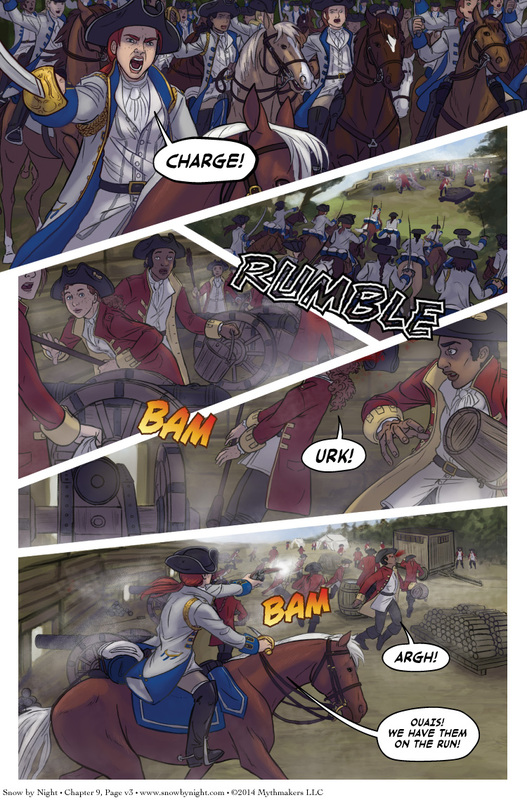 It’s the vote incentive on Top Web Comic. Ow. Th’gunner redhead lass is ae goner. Men and women fighting in the same position. That’s a change.